Importance Pituitary adenomas may hypersecrete hormones or cause mass effects. Therefore, early diagnosis and treatment are important. Observations Prevalence of pituitary adenomas ranges from 1 in 865 adults to 1 in 2688 adults. Approximately 50% are microadenomas (<10 mm); the remainder are macroadenomas (≥10 mm). Mass effects cause headache, hypopituitarism, and visual field defects. Treatments include transsphenoidal surgery, medical therapies, and radiotherapy. Prolactinomas account for 32% to 66% of adenomas and present with amenorrhea, loss of libido, galactorrhea, and infertility in women and loss of libido, erectile dysfunction, and infertility in men; they are generally treated with the dopamine agonists cabergoline and bromocriptine. Growth hormone–secreting tumors account for 8% to 16% of tumors and usually present with enlargement of the lips, tongue, nose, hands, and feet and are diagnosed by elevated insulin-like growth factor 1 levels and growth hormone levels; initial treatment is surgical. Medical therapy with somatostatin analogues, cabergoline, and pegvisomant is often also needed. Adrenocorticotropic hormone (ACTH)–secreting tumors account for 2% to 6% of adenomas and are associated with obesity, hypertension, diabetes, and other morbidity. Measurement of a late-night salivary cortisol level is the best screening test but petrosal sinus sampling for ACTH may be necessary to distinguish a pituitary from an ectopic source. The primary treatment of Cushing disease (hypercortisolism due to ACTH-producing adenomas, which is the cause in approximately 65% of the cases of hypercortisolism) is adenoma resection and medical therapies including ketoconazole, mifepristone, and pasireotide. Hyperthyroidism due to thyroid-stimulating hormone–secreting tumors accounts for 1% of tumors and is treated with surgery and somatostatin analogues if not surgically cured. Clinically nonfunctioning adenomas account for 15% to 54% of adenomas and present with mass effects; surgery is generally required, although incidentally found tumors can be followed if they are asymptomatic. Conclusions and Relevance Patients with pituitary adenomas should be identified at an early stage so that effective treatment can be implemented. For prolactinomas, initial therapy is generally dopamine agonists. For all other pituitary adenomas, initial therapy is generally transsphenoidal surgery with medical therapy being reserved for those not cured by surgery. April is always Cushing’s Awareness Challenge month because Dr. Harvey Cushing was born on April 8th, 1869. Thanks to Robin for this wonderful past logo! 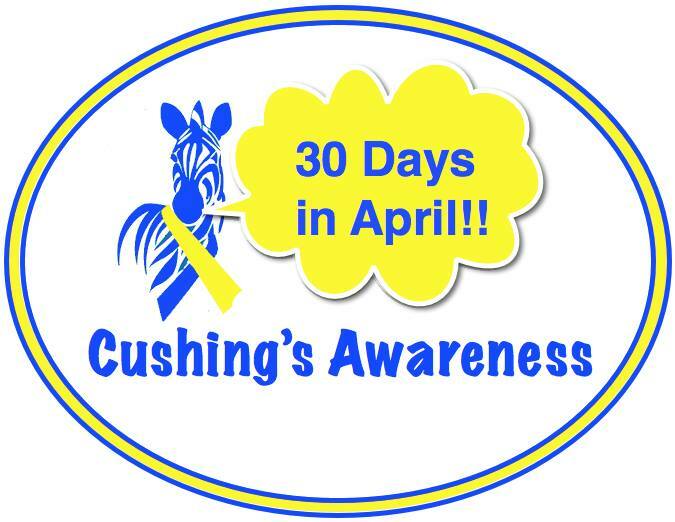 I’ve participated in these 30 days for Cushing’s Awareness several times so I’m not quite sure what is left to say this year but I always want to get the word out when I can. As I see it, there have been some strides the diagnosis or treatment of Cushing’s since last year. More drug companies are getting involved, more doctors seem to be willing to test, a bit more awareness, maybe. Doctors tell us Cushing’s is too rare – you couldn’t possibly have it. April Fools! All you have to do is exercise and diet. You’ll feel better. April Fools! Those bruises on your legs? You’re just clumsy. April Fools! Sorry you’re growing all that hair on your chin. That happens as you age, you know. April Fools! Did you say you sleep all day? You’re just lazy. If you exercised more, you’d have more energy. April Fools! You don’t have stretch marks. April Fools! You have stretch marks but they are the wrong [color/length/direction] April Fools! The hump on the back of your neck is from your poor posture. April Fools! Your MRI didn’t show a tumor. You couldn’t have Cushing’s. April Fools! This is all in your mind. Take this prescription for antidepressants and go home. April Fools! If you have this one surgery, your life will get back to normal within a few months. April Fools! What? You had transsphenoidal surgery for Cushing’s? You wasted your time and money. April Fools! I am the doctor. I know everything. Do not try to find out any information online. You could not have Cushing’s. It’s too rare… April FOOL! So now – who is the April Fool? It wasn’t me. Don’t let it be you, either! Debillon E, et al. J Clin Endocrinol Metab. 2015;doi:10.1210/jc.2015-2662. In patients with evident Cushing’s syndrome related to primary bilateral macronodular adrenal hyperplasia, unilateral adrenalectomy of the large gland appears to be a suitable alternative to bilateral adrenalectomy as a first-line treatment, according to recent findings. Unilateral adrenalectomy yielded normalized urinary free cortisol and improved Cushing’s syndrome, according to the researchers. Olivier Chabre , MD, PhD, of the Service d’Endocrinologie-Diabétologie-Nutrition in France, and colleagues evaluated all patients (n = 15) with overt Cushing’s syndrome related to primary bilateral macronodular adrenal hyperplasia who underwent unilateral laparoscopic adrenalectomy of the larger gland between 2001 and 2015. Patients were seen for clinical and biological follow-up assessments at 1, 3 and 6 months postoperatively, 5 years after surgery and at the time of the last available urinary free cortisol measurement. The study’s primary outcome measures were pre- and postoperative levels of urinary free cortisol, plasma cortisol, adrenocorticotropic hormone (ACTH), BMI, blood pressure, plasma glucose and lipids and measurements of these values on follow-up assessments. Patients were followed for a median of 60 months. The researchers found that in early postoperative measurements, all 15 patients who underwent unilateral adrenalectomy achieved normal or low urinary free cortisol. Between 7 days and 1 month, there was a decrease in median urinary free cortisol from 2.19 times the upper limit of normal (ULN) at baseline to 0.27 ULN (P = .001). At 1 month, only one patient had elevated urinary free cortisol, and this patient went into remission by month 3 and continued to be in remission after 12 years of follow-up. Forty percent of the patients developed adrenal insufficiency after unilateral adrenalectomy and latent adrenal insufficiency could not be excluded in two of the other patients. No predictors of postoperative adrenal insufficiency were identified. Six of the patients had diabetes before unilateral adrenalectomy surgery; four of those were treated with antidiabetes drugs. At 12 months, only two of these patients had a continued need for antidiabetes drugs and had reductions in HbA1c despite decreases in their treatment. Recurrence occurred in two patients, demonstrating urinary free cortisol above the ULN at 7 years postoperatively and 8 years postoperatively. Both cases required treatment with mitotane, and in one of the patients, adrenalectomy of the second gland was required 9 years after the initial adrenalectomy. According to the researchers, postoperative management and vigilant follow-up is needed in order to monitor patients for the risk for adrenal insufficiency. As it moves into crucial Phase 3 drug trials for its flagship migraine treatment, Bothell-based Alder Biopharmaceuticals (Nasdaq: ALDR) is looking to raise a lot of cash. Alder is offering up to $200 million shares of its common stock, according to SEC filings. The company plans to use the money to develop its drugs ALD403 (its migraine drug) and ALD1613 (for Cushing’s disease), conduct clinical trials and commercialize these drugs. Funds will also go toward “general corporate purposes,” which might include the acquisition or licensing of other products, businesses or technologies, according to those filings.